Students are responsible for keeping their accounts current, and should check their account status regularly online through WebAdvisor or by contacting the Office of Financial Services via email at studentaccounts@nscad.ca. It is the student’s responsibility to comply with the ﬁnancial regulations and payment schedules of NSCAD. Registration is regarded as incomplete until all fees have been paid in full. Financial dates are different from academic dates. Students are required to pay all required fees in full each semester by the following dates: September 19 (FALL 2018) /January 17 (WINTER 2019). Tuition refund dates are posted above. Students must advise the Registrar’s Office that they are planning to drop a course. Not attending classes does not constitute an official withdrawal. Please view the academic calendar for withdrawal options. Domestic health plan refund requests must be submitted online by the end of the month in which the semester begins. Further inquiries should be directed to the SUNSCAD office: 902 494 8127. For international health plan opt-out inquiries contact Joann Reynolds-Farmer at jfarmer@nscad.ca in the OSE office. 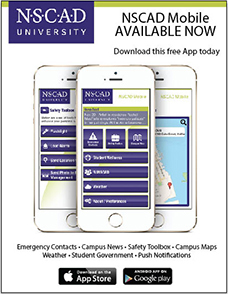 U-Pass is non-refundable without SUNSCAD approval. Material, technology and facility fees are non-refundable after the first day of classes. Material fee refunds are permitted with instructor approval, please contact the technician assigned in the applicable department. Students taking courses at other universities on a Letter of Permission are expected to pay fees directly to the other institution. Students should factor in these additional tuition and fee payments when applying for student loans. Academic registration is not valid until fees are paid in full. Unpaid fees remaining after the due date may result in cancellation of student privileges, including access to campuses, studios, e-mail, webadvisor, brightspace, computer network access, cancellation of enrolment and withdrawal from future classes at NSCAD. For additional details, please review policy 4.10 Tuition and Fees Payment and Refund Policy in the University Policies section on the website for further information. July 31: Students with outstanding balances up to and including the Summer semester will be removed from Fall and Winter classes for non-payment. Reinstatement and registration after payment of fees will mean the loss of any registration priority. November 15: Students with outstanding balances up to and including the Fall semester will be removed from Winter classes for non-payment. Reinstatement and registration after payment of fees will mean the loss of any registration priority. March 1: All outstanding fees must be paid for students to be eligible to register for future terms. Late Payment Interest Fee: Interest of 12% will begin accruing on all outstanding accounts 30 days following the ﬁnal due date for semester fees. A late payment fee of $50 will be assessed on all accounts that are past due. NSCAD university students applying for Canada Student Loans and provincial student loans must have the loans made out to NSCAD University as the official Institution of Record. Most student loans are now processed electronically, if you have questions regarding your student loan application please refer to our Financial Aid Office. Students should apply for Canada Student Loan and provincial assistance at least three months before they expect to begin study at NSCAD to ensure funds will be available at the beginning of the term. Late payment fees will apply if students do not apply on time and payment is delayed. In Mid-August for FALL, Mid-December for WINTER and Mid-April for SUMMER, NSCAD University will begin to verify your registration for the loan files we have received. After confirming you are registered full-time, we will process your loan online for any outstanding tuition and fees at that time. The remaining balance of your loan (if applicable) will be sent to you directly by Canada Student Loan and may take up to 2 weeks to be processed. Any additional courses registered into after this date will lead to additional charges on your account for which you will be responsible to pay directly. We cannot process loans more than once. Please note that Waitlist courses do not count towards your course load until you are officially registered. Any credit balance on your account that results from dropping or withdrawing from a course that was paid with a student loan must be refunded directly to the National Student Loan Office. In order to register for any semester, a $100 deposit (non-refundable once classes begin) will be required at the time of registration. Student Accounts must approve all ﬁnancial arrangements. Questions regarding such arrangements should be directed to 902 494 8117. Choice Financial, Central 1 Credit Union and Atlantic Credit Union. When you go to your online bank account set NSCAD up as a payee as opposed to Nova Scotia College of Art and Design. Your account number is the 6 digit or 7 digit ID number shown on your NSCAD ID card (use all numbers including the 0’s at the beginning of the number). Pay in person at any of the above-mentioned financial institutions. Bank or Postal Money Order in Canadian funds payable to NSCAD University. Cheque (current dated) from a Canadian financial institution made payable to NSCAD University. Students are expected to provide materials for their classes. In most cases, these materials can be purchased from the NSCAD Supply Store. However, in some cases, due to the nature of the materials and the economy of bulk purchasing, materials will be purchased by the University and made available to students from the department or instructor. Students registered in courses for which such bulk purchasing is done will be required to pay a Materials Fee. In such cases, the amount of the Materials Fee will be published in the course outline distributed at the first class meeting, and the amount will be automatically charged to the student’s account. The committee composed of 2 members from SUNSCAD, 1 technician, 1 faculty member, 1 member of the Finance & Administration team, and the VPAR (chair) vetted all materials fees and proposed the introduction of a Studio Production Fee. It was proposed that a “Studio/Production fee” be introduced to account for supplies that are not specifically allocated to each student but that do need to be readily accessible to ensure the viability of the lab or studio and the richest experience of students. These indirect materials are not covered by tuition nor the current Material Fee, and yet students benefit from ready access to caustic WHMIS controlled substances, propane, a variety of glazes, printing inks, paper types, thread, i.e., materials which stock the labs and studios, but which are not directly consumable materials (under the definition for Materials Fees, especially since variety and choice are not criteria for Materials Fees). In March 2018, the student body was surveyed. They were presented with clear and concise definitions of materials and studio/production fees, along with a table of the fees per course, via Brightspace to ensure that all students received the information. The students unanimously endorsed the fees. The students were also assured of NSCAD’s commitment to consult annually (specifically by November 15) on any changes, additions or deletions to materials fees and studio production fees. Going forward, NSCAD commits to annually consult on changes or additions to materials fees and studio/production fees. Following the timelines of the Academic Calendar, any changes to fees (additions, deletions, adjustments) will be circulated to all current students by November 15 and a consultation be held at that time to discuss any questions or concerns about the materials and/or studio/production fees. The consultation will include open meetings and wide consultation through digital fora. Questions about materials fees or studio/production fees should be directed to Dr. Ann-Barbara Graff (Vice-President, Academic & Research). All International and exchange students will be automatically enrolled in NSCAD’s International student health plan. This plan ensures that students have adequate coverage for Canadian medical services. NSCAD’s International student health plan is currently provided through Travel Insurance Coordinators Ltd (TIC). The coverage is for a 12 month period of September 1 to August 31 at a cost of $650. All prices are subject to change. The cost of this mandatory single plan will be included on the student’s account with no exceptions. Note that exchange students visiting for less than 4 months may be eligible for short term coverage at $236 per term. Student’s who become eligible for MSI can opt out of the plan. Students may also purchase additional coverage for spouse or family directly from TIC. For additional information, contact the Manager of Financial Aid and Student Counseling by email at cwarren@nscad.ca or by telephone at (902)494-8130.